Fridge freezers offer the convenience of giving you both a freezer and fridge in a single appliance, so it’s a great option if space is at a premium or if you want everything in one place. Depending on the design and layout of your kitchen you may opt for an integrated fridge freezer that is completely hidden behind furniture doors or a freestanding model which come in many different designs and colours. We also having freestanding matching sets available, so you have a wide choice for your kitchen. If you are planning on using the fridge section more than the freezer section, then a model with either 70/30 or 60/40 split will be the one to go for and if you plan on using both equally then a 50/50 split gives you the best of both worlds. Many models also come with frost free technology so you don’t need to worry about frost build up inside the freezer compartment. 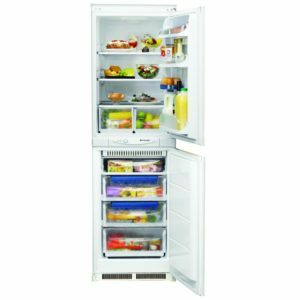 This superb integrated fridge freezer from Hotpoint is designed to be fitted into a tall housing unit with your furniture doors on the front. It has an A+ energy rating and boasts an impressive total capacity of 228 litres. 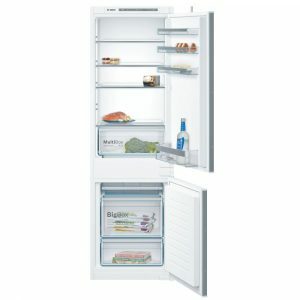 This model is classed as a 50/50 split as the fridge and freezer sections take the same size doors. 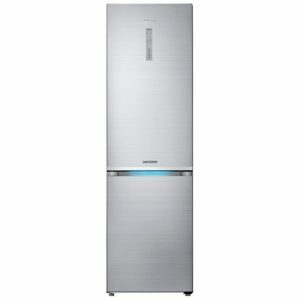 Samsung and style go hand in hand and there's no exception with this sleek, silver freestanding fridge freezer. The perfect complement to any kitchen, the RB37J5230SA boasts 367 litres of capacity and includes great features such as the cool zone drawer in the fridge - perfect for chilling meats and fish. Defrosting the freezer is a thing of the past thanks to the frost free technology and thanks to the A+ energy rating, you can cut down on your household bills too. 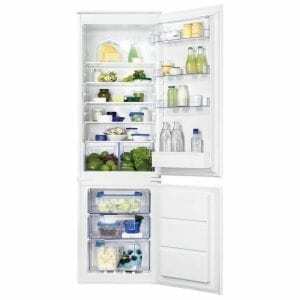 With frost free technology to reduce maintenance, this fridge freezer from Liebherr is designed to be fitted into a tall housing unit with your furniture doors on the front. Boasting an impressive total capacity of 256 litres and an efficient A++ energy rating it's ideal for a busy kitchen. 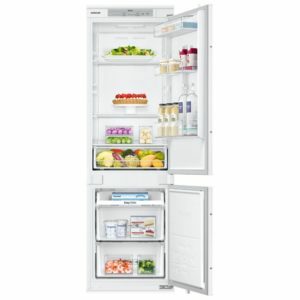 This model is classed as a 70/30 split as it has a larger fridge than freezer. 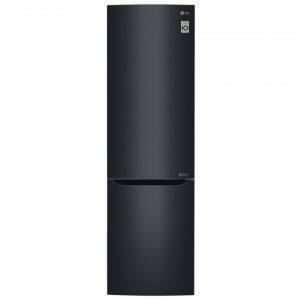 This fantastic integrated fridge freezer from AEG is designed to be installed with furniture doors attached, so you can keep the streamlined design of your kitchen. With 253 litres of storage space available, bright LED internal lights and touch controls, the SCE8181VTS is easy to use. Dynamic Air flow maintains an even temperature and humidity throughout, so all your food will be kept in great condition, whether it's crispy salad or creamy ice cream. Boasting a handy frost free interior, you won't have to worry about manually defrosting the compartments either. 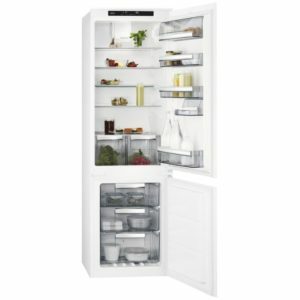 If it's space you are after then look no further than this fantastic side by side fridge and freezer from Liebherr. Boasting a total capacity of 634 litres, there's plenty of space for the weekly shop and then some. 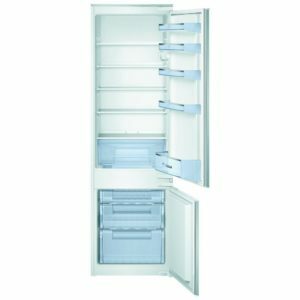 Featuring a large fridge and a frost free freezer, the SBSEF7242 combination gives you space and flexibility to organise your food how you like across the many shelves and drawers. 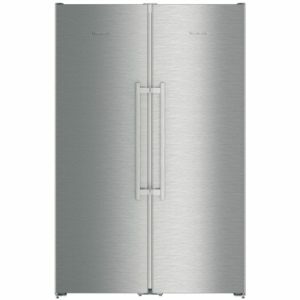 Both the fridge and freezer are finished in stainless steel and are complete with easy open handles. 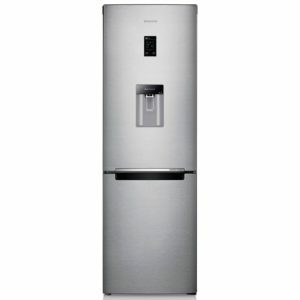 With an impressive 267 litres of space, this brilliant integrated Bosch fridge freezer is ideal for a modern kitchen. Designed to be installed within a tall housing unit and with furniture doors attached, you won't be able to see it once fitted. Complete with a clever Multi Box, you can store your fruit and vegetables for longer, thanks to the rippled base which draws away condensation for better storage and enduring freshness. In the freezer, you will be able to put even the largest of cakes in the fantastic Big Box, and when it is time to load the freezer you can use the Super Freeze function to keep the interior temperature low while you pop in all your new food. With a generous 297 litres of capacity you will be able to fit in all your favourites with ease, particularly with handy features like the Big Box, which offers extra space for those larger items. Multi Air Flow systems keep a constant supply of air through the compartments, which maintains the temperature for perfectly stored food. Your lettuce will remain crispy, your carrots crunchy and your ice cream creamy. As this model is also frost free, you can save yourself time and bother as you won't have to manually defrost again! 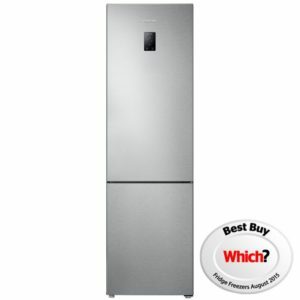 Introducing this energy efficient, integrated fridge freezer from Bosch! 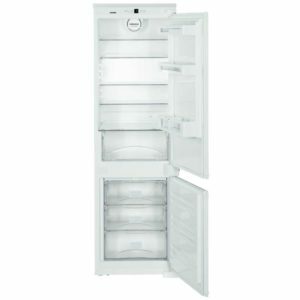 Classed as a 70/30 split, this model offers 277 litres of space, with the fridge being larger than the freezer. The refrigerator section has 5 safety glass shelves, 5 extra deep door balconies and a salad crisper. Your fruit and vegetables will be looked after in the salad drawer, as it features a rippled base helping to protect produce from condensation. 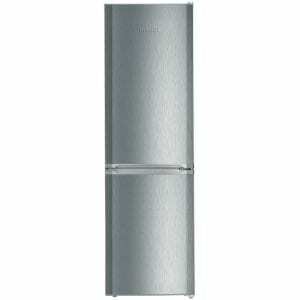 Being an integrated model, it's designed to be fitted into a tall housing unit with your furniture doors on the front. 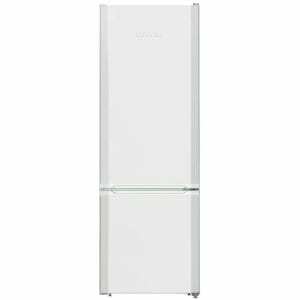 This superb freestanding SmartFrost fridge freezer is 55cm wide and 161cm tall and offers plenty of storage for a smaller household with 265 litres capacity. It has an excellent A++ energy efficiency rating which is sure to keep your energy bills low and with its crisp white exterior it’ll look great in any kitchen. The FrostSafe feature keeps your frozen food protected from cold air loss with its extra high drawer fronts and SmartFrost technology freezes your goods much quicker than a typical freezer would. Added features including a bottle rack and transparent drawers in the fridge allow better storage and organisation. 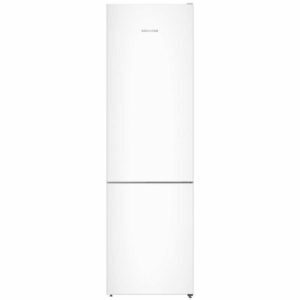 This superb integrated fridge freezer from Zanussi is designed to be fitted into a tall housing unit with your furniture doors on the front. It has an A+ energy rating and boasts an impressive total capacity of 253 litres. 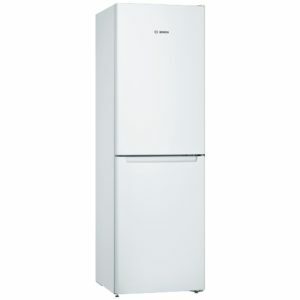 This model is classed as a 70/30 split as it has a larger fridge than freezer. Fridge freezer playing up? Find out whether you can solve your fridge freezer issues yourself, or if it's time to renew and upgrade. All your fridge freezer questions answered.